The book for Stephen Shore’s 2017/18 retrospective exhibition at MoMA, New York, is organized as an A-Z. David Campany has written nine of the alphabetical entries. 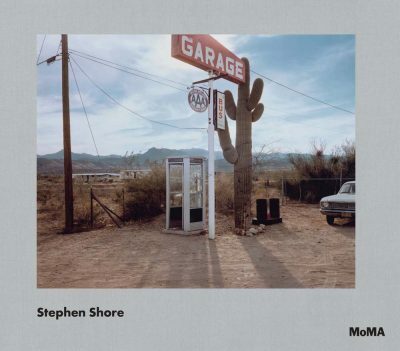 Stephen Shore, edited by Quentin Bajac, text by David Campany, Kristen Gaylord, Martino Stierli. The Museum of Modern Art, 9781633450486 u.s. Hbk, 10.5 x 9 in. / 336 pgs / 450 color. On October 1, 1890, Yosemite became America’s third national park, after Yellowstone and Sequoia. It covers around 1,200 square miles of Northern California, but many of today’s five million annual visitors spend their time in the seven square miles of Yosemite Valley. Of all the national parks, Yosemite is the one most closely associated with the history of American photography. Carleton Watkins first photographed Yosemite Valley in 1861, and his images helped to persuade President Lincoln to sign a bill in 1864 to protect the region, paving the way for the national park system. Eadweard Muybridge’s 1867 photographs of Yosemite were reproduced in newspapers and as guidebook illustrations, and were also sold in great numbers to a public eager for images that would symbolize a mythic origin for the nation. The wet-plate collodion technique used by these photographers required an intrepid team to travel to the remote region transporting “mammoth plate” cameras that produced 22-by-18-inch negatives. The promise of the untouched sublime American landscape reached its modern apogee in the photography of Ansel Adams, who first visited Yosemite Valley in 1916 and shot there regularly beginning in the 1920s. One of his best-known images, the monumental Moon and Half Dome, was made in 1947, the year Stephen Shore was born. By the time Shore came to photograph the location for himself, it was an enormously popular destination, with Californians flocking there from increasingly polluted cities, commercialized road trips bringing busloads of tourists, and international visitors arriving on cheap flights. On an outcrop overlooking a languorous bend in Yosemite’s Merced River, Shore set up his 8×10 camera (not as large as the equipment of his early predecessors, but still substantial). He framed the landscape classically, with a defined foreground, middle ground, and background. On the hazy horizon, he included Half Dome, perhaps as a nod to Adams, but to integrate the mountain into his own picture, Shore mirrored its distinctive profile with that of a tree at the extreme right of his frame. It is the human presence that defines this picture. The rhythms and values of a leisurely day are the counterpoint to the cycle of the seasons and the backdrop of geological time. Casting shadows like sundials, each person in the scene appears suspended in time, but this is not simply the effect of Shore’s shutter. The human figures achieve—accidentally and momentarily—an unlikely pictorial ideal, and formal perfection always evokes a suspension of time. As a further accent on this strange effect, one of the figures is photographing another. Photographs are not narratives, but they do invite us to fill in the blanks, to extrapolate and speculate. So, somewhere in the world, perhaps in a dusty family album, there is a snapshot of a young blond boy standing ankle deep in the Merced River. As he wades into the cool water, he turns, squinting in the sun toward the Instamatic camera of his older sibling. Or perhaps he is looking past that camera to his mother, who holds the hand of the youngest member of the family, who is a little wobbly on delicate feet. What else is in the snapshot we see being taken here? Behind the boy in the water, up on the rocks, is a man. Tall, aged thirty-one, he stands next to a large wooden camera mounted on a tripod.